Is your thyroid gland the culprit? How many times have you heard these words stated? Hearing these types of statements many times, from well-meaning friends, relatives and even doctors, can be very discouraging when those around you do not understand your physical and mental suffering. You may wish that they could live inside your body for just one day, and experience the symptoms you have to deal with constantly. However, it does come as a relief when you do find a doctor or person who understands, to a degree, or shares similar experiences. In Australia, in particular, the average person knows little about thyroid disorders and their detrimental effects upon health. Moreover, it has been difficult for some patients to find a doctor who is willing to test thoroughly, to make a diagnosis, and then explain their condition clearly. There are many diseases and illnesses that have similar symptoms and it can be difficult for a doctor to make a quick diagnosis. It is therefore important to have a thyroid function test to rule out any possibility of thyroid abnormalities. Thyroid disorders can produce a multitude of symptoms that can affect any or every part of the body. 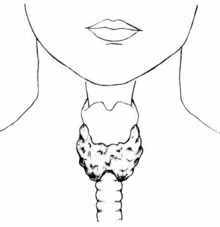 The thyroid gland is an endocrine (meaning ductless) gland, which secretes its hormones directly into the bloodstream. It is located in the lower part of your neck. It wraps around your windpipe (trachea) like a bow tie, with two connecting lobes, and is well supplied with blood vessels. The thyroid gland contains cells that secrete chemical substances called hormones. The main 2 hormones made by the thyroid gland are called thyroxine (T4) and triiodothyronine (T3), with T4 being produced in much greater quantities than T3. T3, however, is the primary active hormone. T4 is much less active and while it does produce a limited effect, most of the T4 must be converted to T3 before it can be used by the body. This conversion takes place in particular organs (primarily the liver) and tissues, and is extremely important for the overall functioning of the body. These hormones act like chemical messengers and deliver instructions to various tissues and organs (target organs) via the bloodstream. The cells within these organs then use the thyroid hormones and respond by speeding up or slowing down their activities. Overall, the thyroid gland is responsible for the speed of metabolism (metabolic and chemical processes) in our bodies, by affecting every cell, tissue, organ and organ system. The thyroid gland is therefore essential for life, growth and development. Thyroid hormones affect body temperature and circulation, appetite, energy levels, growth, skeletal development, muscle tone and agility, cardiac rate (force and output), fluid balance, blood sugar levels, central nervous system function, bowel function, blood fat (cholesterol) levels, and the regulation of fat, carbohydrate and protein metabolism in all cells. The amount of T3 and T4 produced by the thyroid gland is controlled by the pituitary gland at the base of the brain. It does this by secreting thyroid stimulating hormone (TSH). When the levels of T4 and T3 fall, the pituitary secretes more TSH. When T4 and T3 levels rise, the pituitary secretes less TSH. Normally this complicated production and control system ensures that the body has just the right amount of T3 and T4, but it can go wrong. When the thyroid gland produces too much thyroid hormone (becoming overactive), the condition is called hyperthyroidism. When the thyroid gland produces too little thyroid hormone (becoming underactive), the condition is called hypothyroidism. The most common cause of hyperthyroidism is an autoimmune condition called Graves' disease. With Graves' disease the body produces antibodies which behave like TSH and stimulate the thyroid gland uncontrollably, to make too much thyroid hormone. The most common cause of hypothyroidism is also an autoimmune condition, called Hashimoto's thyroiditis. With Hashimoto's thyroiditis, white blood cells invade the thyroid gland and attack the tissue, and the immune system produces antibodies which interfere with the production of the thyroid hormones. With some individuals there can be a malfunction at the cellular level, where the cells of the body do not respond to or utilise thyroid hormones correctly. The receptor sites in cells may be resistant to thyroid hormones and the chemical messages may not be received. The successful conversion of T4 into T3 may also be hindered within the cells, and the body is then starved of sufficient amounts of T3. These problems with T4 to T3 conversion and thyroid hormone resistance are uncommon, and they can be easily misdiagnosed. Another uncommon problem relates to the pituitary gland. It can malfunction and produce too much or too little TSH. This has a direct impact on thyroid function and the amount of T4 and T3 produced. Thyroid related illnesses have a variety of causes, and sometimes the problem is not with the thyroid gland itself. Whatever the cause, abnormal physical and mental symptoms will appear, which can range from mild to severe. Here are the types of complaints that characterise hyperthyroidism—an overactive thyroid gland. Palpitations, fast pulse and irregular heartbeat. Hot flushes and increased sweating. Increased appetite (or loss of appetite). Weight loss (especially if eating well). Anxiety, nervousness and/or panic attacks. Eye complaints (especially gritty or bulging eyes). Fatigue, exhaustion and lack of energy. Menstrual cycle disturbances (intermittent and light). Not everyone has all of these symptoms. You may relate to only a few of the above conditions, or you may relate to many of them. Everyone is different. Hypothyroidism has been called the ‘unsuspected illness’ and one that is frequently misdiagnosed. The manifestations that characterise hypothyroidism — an underactive thyroid gland — are the following. Feeling cold (especially hands and feet) even on warm days. Fatigue, exhaustion and low energy (even after 12 hours sleep). Slowness of thought processes (brain fog). Pain and stiffness in muscles or joints. Depression, mood swings and severe PMS. Creviced, cracking skin on heels, elbows and knee caps. Lump in throat (hard to swallow). Menstrual cycle irregularities (prolonged and heavy). Numbness and tingling (especially in hands and face). Fluid retention (swelling of face and feet). Once again not everyone has identical symptoms. You may relate to some of these conditions, or you may relate to many of them. Everyone is different. A person suffering from either an overactive or underactive thyroid gland may display many of these symptoms, and find that coping from day to day is extremely difficult. The pressure on bodily functions will continue to increase unless appropriate treatment is given. A thyroid function test should be performed, measuring the levels of thyroid hormones in the blood. Immunoassay techniques for diagnosing thyroid disorders measure the amount of circulating hormones in the blood very accurately. A thyroid function test (TFT) generally consists of the following. Normal reference ranges have been developed for the various hormone levels. These may differ slightly depending on the laboratory's assay methods (methods of analysis). Any blood test results that show hormone levels outside of these ranges usually indicate a potential thyroid problem. The TSH level is a good indicator of thyroid function and is considered the most important hormone to be initially tested. Thyroid Stimulating Hormone (TSH), produced by the pituitary gland, is therefore the first hormone assessed when suspecting a thyroid disorder. If the TSH level is abnormal, a far clearer picture of thyroid function is needed, and T4 and T3 levels must also be tested to ensure a correct diagnosis. People with a diagnosed thyroid problem must also ensure that their T4 and T3 levels are routinely tested along with their TSH level. If the diagnosis were unclear, with blood tests results near the outer limits of the normal range, it would be wise to have a thyroid antibody test. This may indicate that your thyroid gland function is being compromised, especially if you present with classic thyroid symptoms. When it comes to thyroid conditions, it is extremely important to find a doctor (or specialist) with a sensitive and compassionate approach, who is willing to work with you, and vice versa. Communication needs to be open and honest and you should feel comfortable in asking questions concerning your condition. It is also important to know and understand your thyroid function tests, and you should feel confident in asking your doctor for copies of your lab results. It is definitely worth researching and understanding your thyroid disorder before making a decision on treatment. Your doctor will explain the most appropriate procedures with regard to your condition, and then you can make a fully informed decision, once you understand your options. Successfully treating and recovering from thyroid related illnesses does take time. Dedication from both the patient and doctor is needed. Medications and procedures will be required to increase or decrease the levels of thyroid hormones in circulation. Hypothyroid patients will be given T4 (thyroxine) in tablet form, to restore the amount of thyroid hormones in the body to normal. Hyperthyroid patients may be given anti-thyroid medication to reduce the amount of thyroid hormones made by the thyroid gland. Some patients will recover relatively quickly and will only need occasional blood tests to keep check of thyroid hormone levels. For others, their treatment may be tedious and complicated, and may require surgery. It could take up to a year or more to stabilise thyroid function. This will depend upon the severity, and type, of condition. Overall, patients well cared for and treated appropriately should enjoy a healthy vibrant life with a lowered risk of long-term health problems. Reproduced with the kind permission of Thyroid Australia. Thyroid Australia is a support organisation for people with thyroid conditions as well as their families and their friends. Thyroid Australia is a voluntary organisation whose founding members have suffered or been affected by various thyroid conditions and who wish to help others in similar situations. Learn about the signs, symptoms and treatment of thyroid disease in children.